The Canadian Genealogy Centre is a great place to start your Canadian Family History.With free Databases, good advice and links to other sites it is well worth a visit. Migration to Australia is still a dream to many, just as it was for our Ancestors. For those of you thinking about Migration take a look at this Government website. I would just like to wish all readers and Followers of Your Ancestors Free.Com a very happy and safe Christmas. The last few days have been really hot and humid in Perth, Western Australia, so different to the weather in England. I hope that England has now seen the worst of the snow. Looking froward to hearing from some of you in the new year. At last Ancestry has started to release the 1911 English Census. At the moment,just the Census summary books are available to search. I have not found it to be very productive ,hoping that the full release is made available soon. If you are researching Irish Ancestors then you may have been to this site before . The good news is that the information for Wills has been greatly improved. Now a fully search able index to the Will Calender entries of Armagh, Belfast and Londonderry is available online for free. The database covers 1858-1914 and 1922-1945. Digitised images of entries for the period 1858 1900 are also online and are free to view. Most West Australians will have visited Fremantle, no doubt to have 'Fish and Chips'. Are they aware though of the Army Museum there and the part it played in the 1st and 2nd World War? Take a look at the Museum and the role it has played. I don't know how it managed to get here so fast this year but we are now in the big countdown to Christmas. If you are wondering what to give the keen family history researcher as a present, then membership of a big Ancestry site may be a good idea. As you are reading this ,then you may be thinking that you would like this for yourself. You could drop a few hints or go the whole hog and buy it for yourself. Ever since i received a Microwave for Christmas i have either asked for a particular thing or gone out and bought my own present. Another present that would suit the researcher is the DVD set of the TV series 'Who do you think you are' This has been a TV show that started in the UK and then Australia and America produced their own series. This may be a particular good idea for those of you who live in a cold climate at Christmas. Have you looked on Ancestry.co.uk lately to see what is new? They now have Naval Medals and Award Rolls 1793-1922. I was able to find the Medal record for my Great Uncle Allen McMullen. He had been awarded the Star, Victory Medal and the British War Medal. Lancashire Ancestors can be be found in Lancashire Cemeteries. This site is free to search the records. To view the Headstone Inscriptions and Burial Records a small fee is charged. For WW1 Casualties the records are free to search and view. While visiting my parents a couple of years ago I was rummaging through some of my late grandmother’s belongings. Prayer books and a few other items. One of the items was an old, sepia toned framed photograph of an older woman dressed in the finery of the day. I asked my mother who she was. She had no idea. Just that it had always been on her mother’s dresser. I asked my aunt. She didn’t know. So, I took the photo out of the frame to look on the back for possible clues. It was one of those old postcard photos. And there was only one word. Rose. No last name. No date. My Nana was not a sentimental woman. She did not hang on to things for very long. And she very rarely talked about her family or her years growing up in the mill town of Lurgan in County Armagh, Ireland. We knew her father died young and her mother remarried. She had told my mother that during that time the kids were with relatives. I have no idea why. Yesterday was the day that we remember, those who gave up their lives for their Country. On the 11th hour of the 11th day in the 11th month we have two minutes silence. I was at home doing the ironing when it came on the radio. For years i never had any connection with this until i found out that my Great Uncle Allen McMullen had lost his life on the 31st May 1916 on the HMS Indefatigable. If your Ancestors came from Ireland, then there is a good chance that you have heard of a few Irish Superstitions. In Irish Folklore he possessed Supernatural Powers. It was said that the Seventh Son would have these powers but if his Father had been the Seventh Son then the powers were greater. My father would tell me the tale that his youngest brother was the 'Seventh Son of the Seventh Son' and on occasions had been able to see into the future. 'Uncle Tony' was indeed the Seventh Son but after finding my Grandfather and his family in the Census. I realised that my Grandfather was the Eighth Son as he was the youngest child of ten, eight boys and two girls. Now we all know that the Irish can tell a tale and my Dad was no exception ! No doubt we will all have a different favourite. Here are my favourite three. I have been asked for Parish Records for Southport, Lancashire. Follow the link, then click on OPC Search which is on the left of the page. Then you need to click on the letter S for Southport . The records are there for Southport. If you do not see the records that you are looking for ,then check back in a couple of weeks as this site is always being updated. Anyone researching Ancestors from Northern Ireland will know how difficult it is to find free records before 1901. One site that is a must for these researchers is PRONI, which is the Public Record Office of Northern Ireland. Proni is currently closed to the Public, opening in Titanic Quarter, Belfast in April 2011. The Online Records are still available,these include the Ulster Covenant, Free Holders Records, Street Directories, Will Calendars and Name Search. My Grandfather was the youngest son of a family of 10. It was wondering what had happened to his brothers that started me on Ancestor research. I had no idea of even the names of his brothers when i first started. The family were lucky than most, that's if you can call the death of one son lucky. So once forgotten, now remembered. Are you looking for your Ancestors in WW1. i have been doing some research on a soldier who was lucky enough to survive the Great War. I came across this site that has lots of good information and may be able to give you some tips in your research. Australia now has its own Saint, Saint Mary Mackillop. Mary Helen Mackillop was born to Catholic Scottish Immigrants on the 15th of January 1842 in Fitzroy, Melbourne. This site tells Mary's story. Ancestry Ireland had an interesting Article on their website about Ned Kelly.I did not know that the Kelly Family came from Banbridge. He was a notorious bush ranger in Australia. Take a look here. This is a new site that covers Lurgan, County Armagh. Click on the link 'Gravestones', i read a wonderful story here about a girl 'Margorie McCall' who lived in Lurgan around 1705. Have you found your ancestors in the census? If your answer is yes them you may be able to view where they lived on Google maps. Check on the Census for their address and then go into Google maps and put in their address. Most places now have street view so click on 'More' and when street view comes up click on that and you could be looking at where your Ancestors lived once. If you have membership for Ancestry.co.uk or are thinking of taking membership,you may have not noticed one of their new features. Ancestry now has the English and Welsh National Probate Calender (Index of Wills and Administration) 1861- 1941. I have found it very useful having found around 4 wills and confirmation of Death dates. This free site is improving all the time, this new search has only come online this week. For this weekend only, Ancestry.com are giving free access to Immigration records. So if you had Ancestors who sailed to the Big Apple now would be a good time to search the records. You can search millions of records on this site free. More records are being added each month so if you do not find what you are looking for now, then check again in a few weeks.I have found quite a few records on this site. It took a bit of time though to bring up the best search. I had the greatest success when i used the advance search. Try in different areas of residence and the names of parents if the results are not showing up. I have been researching my Irish Ancestors lately . As those of you looking for Irish records will already know that its like finding a needle in a haystack. The lack of records is not helped with all the names being the same. I found the marriage record of my Great Grandfather John McMullan and his witness was also called John McMullan. I am looking on sites that i have visited before but i still find new bits of information. One record that i always return too is the Griffiths Valuation. This one is on the Drumaroad and Clanvaragham site and is very nicely laid out. This Genealogy society is located in Perth. It has links to genealogy websites and lists the library's in Perth where records are stored. I was chatting with a friend on facebook the other day,she lives in America. I mentioned that we had a new Prime Minister and that she was a 10 pound pom. She had no idea what i was talking about so this posting is for her and anyone else who does not know the meaning of a 10 pound pom. Created as part of the "Populate or Perish" policy, the scheme was designed to substantially increase the population of Australia and to supply workers for the country's booming industries. In return for subsidising the cost of travelling to Australia — adult migrants were charged only ten pound sterling for the fare (hence the name), and children were allowed to travel for free — the Government promised employment prospects, housing and a generally more optimistic lifestyle. However, on arrival, migrants were placed in basic hostels and the expected job opportunities were not always readily available. I have a new hobby, one that is sort of connected to the past. Its collecting. I started off collecting Blue Delft , and Swedish Glass . I picked up a nice China milk jug that is from a company Barratts in England, so now i will try and find the matching set or at least the teapot and the cup and saucers . It would be wonderfull if i had a dinner service that had been pasted down through the ages, but i am not so lucky. So how about you? have you still got the family Dinner service that was used by your ancestors. Is it just me or has the price of Genealogy Sites suddenly gone up in price? I have always paid by the month which works out to be more expensive but i would imagine that most of you will pay this way. On checking today i found that the UK Heritage monthly was $21.95. The UK Heritage Plus monthly was $24.95 and the World Heritage monthly was $49.95. I seem to remember not too long ago paying around $34 Australian dollars for The World Heritage monthly.I am not aware of any new collections having been added on to Ancestry.Com. So it seems to me that Ancestry are losing customers, so what do they do ,they put the price up. The people who take out membership have to pay more to compensate for lesser numbers. I would have thought that dropping their prices would bring in more customers. Thankyou to all Gennealogy Sites that are Free to trace your Ancestors. Its always the case, you have full membership from Ancestry.com and you don't use it. Then you need to do a look up and you can not do that as no one is giving free search and downloads of the 1901 English Census. I am reluctant to take out membership just for one look up .The Irish have the right idea,the 1901 and the 1911 Census is free to search and download the results. Does anyone know where you can view and download the 1901 English Census for free? The only site that i found gave a free days viewing in 2005 not that thats going to help me now. Do you all feel the same? In the comments today at Your Ancestors Free.Com there was a request for information regarding old village place names. The reader was having a problem locating old villages on today's maps. Sometimes the names have changed slightly such as higher or lower, little or big.In answer to the request i have included a link to a web site where the owner is researching the same area as the reader. At last the Census we have all been waiting for, the Irish 1911 Census is now on line. It is also free for everyone to search. So take a look for those Irish Ancestors. I have mentioned this site before but as its so unusual i thought that i would mention it again. See your past haunts on a collection of Photos. You can revisit the place where you grew up or a favourite holiday spot. Leave a comment about a photo and the web site will e-mail the link back to you when someone else leaves a comment. My posting on the River Mersey and Pilots has brought in many comments, mainly on people looking for information about Ancestors. I will try to help where i can and i always try to reply to your comments. A comment came in today about a Richard Hunt, a flatman. I have found his name mentioned on a site ,the link below will take you to the web page. If you are researching Ancestors in Northen Ireland then i would recomend the web site Emerald Ancestors. This site covers Irish Ancestors in Counties Antrim, Armagh, Down, Fermanagh, Londonderry and Tyrone. It is a paid site but at 10 pounds for one month,i think its good value. If you have a friend researching the same area then it pays to take the monthly membership in turn. It is very easy to do look ups for each other. The main information on the site covers marriage and birth records. One of the favorite TV shows in my house is Antiques Roadshow. You may be lucky enough to have something passed down from an earlier generation. This does not have to be an expensive painting or chest of drawers. Some of the most precious items could be family photos or letters. Both of these can help tell a story from your family's past. Imagine if your ancestors had left England or Ireland to start a new life in the United States Of America. What if you had a photo of that family on board the ship taking them to their new lives. A letter back to the old country in those first few weeks telling of their new lives would be just as precious. Have another look at all your old photos and letters ,you may find out some new information that you had overlooked. I came across this site today, after looking at it about a year ago. I noticed today that they have free message boards for each County in Ireland.I only had a look at County Down and found many messages under a list of Surnames. There are many people out there just like you searching for a link for their family tree. Take a look, it may have some new information. Welcome to all the new Followers of Your Ancestors Free.Com. Thank you for taking the time to join this Blog. If you have any questions or an interesting story then feel free to leave a comment. I was watching a program on the TV today that was about WW2 .Black and white movies of the day were capturing thousands of children loading on to steam trains to take them to a safer haven. My husband commented that his mother had been evacuated as a young child, along with her bother and sister They had been living in London and had been sent to live in Neston,on the Wirral. This move would have a big impact on her future life as she would always live in that area. Take a look at the website below to read about how it all happened. At last we will soon be able to view the 1901 full Irish Cenus. This good news was on the website for the National Archives of Ireland. The Famine in Ireland left many children as orphans. Between 1848 and 1850 many orphaned girls were sent from County Cork to Australia. Take a look at the link ,it has a Database of the girls sent from Cork. It is surprising what you find once you start on a path of research. I have only just begun to look at County Wicklow as someone asked if i had any links to the 1901Census for Wicklow. This lead to finding passenger lists from Wicklow to Canada. Here is another link about those poor Irish leaving their homeland. This may be of interest to those who are researching Ancestors leaving Wicklow for Canada. It covers the years 1847 to 1855. How many times have you thought to yourself 'I wonder what ever happened to so and so' How do you go about looking for them. There are a number of social sites now online where you could find that person who you have lost touch with over the years. Facebook is a good place to start. I have found a couple of old school friends through looking on facebook. Friends reunited is another site where there is a good chance of finding old school or work friends. I have recently being trying to find an old friend from my school days. When i was 14 i went on holiday to France with my high school. The town where i grew up in Lancashire, had a twin town in France. All students were matched with a french boy or girl and went to stay with their family's. A few months after this trip the french students came over to England and it was our turn to play hosts. I have been asked for 1901 Census records for County Wicklow. We are still waiting for all the 1901 records to be available online, soon, it will be soon. Limited records for parts of County Wicklow are available, maybe you could be lucky. Take a look at this link. Thankyou Mary for the following Irish BMD Records. They can be found free of charge on the Family search.org website. The Irish records available are Birth 1620-1881, Deaths 1864-1870 and Marriages 1919-1870. I had a quick look myself and i was able to find confirmation of 3 births. I think the key to getting the right search is in the place name, so try a couple of names around the area you are researching. Now you can trace your ancestors free from 1841 to 1891. The site Free Cen has a Data base that you can search for free to find your Ancestors in the English Census. It is not complete but it is being added too all the time. In doing a search i found that the results were better when i put in a small amount of information. This will be a very good resource that is free for everyone. This is a good resource for researching Australians at Gallipoli. The Anzacs were the Australians and New Zealand Army Co. So many lost their lives here and every year on the 26th April we remember them on Anzac Day. The GRO in England has made some changes to their fee's and services. Due to an increase in current demand for Certificate's present orders will be subject to a five day additional dispatch time. The GRO have also reviewed their range of service's. They have now withdrawn their reference checking service. The cost of the certificates will increase from 7 pounds to 9.25 pounds. This means that you will have to know the references for your certificates. You can find the references when you find the record on the site Free BMD. I have been busy this week starting a new blog, if you are a Cat lover you may enjoy my Blog about Cats.The Star of the Blog, or will be when i get some more photos online is my Burmese Cat Lilly . Well, the countdown has begun to the big release of the 1901 Irish Census . We have only to wait until the end of June this year 2010. This is the link for the Census. While we are waiting for the 1901 census to go online sometime later this year, maybe take a look again at the 1911 Irish Census. The records on this site are very easy to search. Just put in the name you are searching for ,then click on the name to see all the names of the people who lived at that address. If you read the post before this one ,i mentioned an interview with Cyndi Howell who owns Cyndi's List. If you are new to family research you may not have heard of the List. It is a free categorized and cross referenced index to genealogical resources on the Internet. In the interview Cyndi says that she works 12 hours a day 7 days a week. We are all aware that once we start on the research journey ,it is hard to stop . Take a look at Cyndi's list you may find the link to some missing information for your family tree. This is very interesting viewing, something we would not normally see as its on television in America. Megan talks about her research on the 1st Lady whose roots she has traced back to Slavery. I have just been helping a friend order a Birth Certificate from the UK online. Once you know how its a straight forward process. I recommend that you first find the birth, death or marriage details at FreeBMD-Search. Make a note when looking at the record for the name of the District, the Vol and the page number as you will need this information when placing your order for the certificate. This link will take you to the site to order your Birth, Death or marriage certificates online. For the past week i have been doing some family research for my neighbour. It feels so good to be at the beginning of the journey where the records appear and the path is open. So different from my own family research that has come to a stansill. I can not get motivated at the moment to go back to it. No doubt ,some of you are feeling the same. Maybe this is a good thing,a bit like dieting when you reach a Plato. Take a break, think outside the square ,you never know when something is going to pop up on the page. I was looking on the web site Ancestry.co.uk today. In particular the pension records for the 1st World War. Did you know that each record has about 12 to 16 pages to view. What i was looking for was an address and next of Kin and i found them around page 14.So the next time you are looking at the Milatary records keep this in mind, the next of Kin on the record is a big find and could confirm your ancestors place in the family tree. Births, marriages and Deaths from 1856 to the present day. Certificates can be orderd on line to from the following web site. To most people researching their family tree, the information that they need most is the Birth,Death and Marriage records. If you belong to one of the family history research sites then this information is available for your research. If you are looking for free information then take a look at this site where Birth, Death and Marriage Records are available for England. Conducted on 29 September 1939, this emergency census-style survey of the civilian population of England and Wales was taken in order to issue identity cards to the country's residents in response to World War II. Much like a traditional census, the Register contains personal details including name, date of birth, occupation, marriage status and address for each of the country's residents. Members of the Armed Forces were not included in this Register as they had already been called up for military service. Information from the 1939 National Register is available to applications, but only for individuals who have died and are recorded as being deceased. The application is expensive - £42 - and no money will be refunded, even if a search of the records is unsuccessful. Information can be requested on a specific individual or a specific address, and information on up to a total of 10 people residing at a single address will be provided (if you ask for this). This is my favourite free resource for Baptism, Marriage's and Burial in Lancashire. The Database is being updated daily so it pays to visit this site at least once a week. Find your Ancestors in the 1901 Irish Census for free. This database has been updated, so take a look even if you have viewed this web site before. Search using Townland or Surname. Tick the box to search using the Soundex code. Area's covered are Donegal, Down, Fermanagh, Galway, Kerry, Leitrim, Mayo, Roscommon, Sligo, Waterford and Wrexford. One of the most important surviving 19th Century history resource is Griffiths Valuation. This was the 1st full scale valuation of property in Ireland. It was overseen by Richard Griffith and was published between 1847 and 1864. The web site 'Ask Ireland's a very good search engine where you can search the valuation by name or by townland. Your Ancestors Free is back online. You may have wondered why it was quiet on this blog. Well the reason why is this. It was to be my Mothers 80th birthday on the 1st of March. My Brother who also lives in Perth , Australia decided that he would go over to England and surprise our Mum, so i thought that i would go too. When she got over the shock she was pleased to see us. We had a lovely week in england and some good nights out with family. We had just recovered from the jetlag when we had to do it all again. It was good to arrive in Perth,i have had enough of flying now for a while. When you are on a long haul flight to Australia or England you think how amazing it is to be able to fly to the other end of the world so quickly.So different to how our ancestors arrived in Australia after spending weeks on board ships. Even the 10 Pound Poms had to spend a few weeks on board ship before arriving in Australia. So many people have Irish Ancestors and half of them are looking for their family records. Well maybe not half at the moment ,they will soon be starting their search. My Ancestors came from Northern Ireland ,County Down so many of the sites that i recommend are for that area. This site is a must for County Down, it is completely free. Try the Surname search, look carefully as its very possible that your Ancestor is mentioned here.Lots more informmation on this site too, places, Churches. What can make your family research come alive? I have just been watching antiques road show and thinking how a couple of family pieces could make your family history come alive. I have not got any family heirlooms but i have a couple of things that are still special. I was over in England last year and my Mum sorted out some old papers for me,i am always asking her and i thought she had given me all she had before. On looking through what she had given me i was thrilled to find a copy of my Grandads will, my fathers father. It was still in the envelope dated September 1970. It was an interesting will as it involved land, farming land. In order to try and keep the land in the family he had left the land to my cousins who at the time were just school boys. My cousin still lives in the farmhouse today. Still keep asking and searching through family papers, you can still find treasure. Sometimes i think we get so carried away with our family research that we do not stop and think what life was like for our Ancestors. How different we live today ,sat by our laptops in an aircondition room. I am reading the Pulitzer prize wining novel 'Angela's Ashes' and so far i feel humbled by how the family lived in Brooklyn in the 1930's. Home was a couple of rooms in a tenement, where the bathroom would be shared by many. The most dreadfull hardship was not having money to put food on the table. Wages earned by the male bread winner in a lot of cases never made it home after payday, it would be spent on drink on the way home. Our ancestors stories were of hardship and survival,so maybe the next time you are searching for records, stop and think of how they once lived. When i try to imagine what it was like growing up in Ireland in the 30's i always remember this book which also became a film. My father grew up in Northern Ireland in the 30's. He was born into a farming family so there was always plenty of food to eat. Food and the lack of it features in Angela's Ashes' Having waited 40 years before he told his story, Frank did not cover up any details of his childhood. Ancestry has the Death Collection 1837-1915 and Deaths 1916-2005, and Free BMD search has the Death Collection 1916 to 1983. As with the births and marriages the records are free to view on Free BMD search. Find them here. There are a couple of ways to track down a English marriage record. Ancestry has two collections. Marriages 1837 -1915 and Marriages 1916 -2005. The second one is very good too if you are looking for the marriage record of someone who is still alive. Free BMD search has Marriages 1837-1915 and Marriages 1916-1983 and this is free to search and view. The UK birth records are now fully searchable up to 2005. What are you looking for? some tips to help fill in the missing pieces ? or are you at the very beginning? If its the beginning then you probably have most of the facts in your mind now,you just have to record them. At some point you will come across the big Genealogy company's. Ancestry.com offer a free 14 day trial . This is good for the beginning as it is also offers freely a way to record your information. You will find it a good starting point and very thrilling as you begin to find your ancestors. Now that you know a little more on how to start your research save this page to Favorites or sign up to get the sites free feeds. Most of all enjoy your journey and the people you meet along the way. With the snow in England bringing the country to a stand still in the last couple of weeks it was good to see today that the Lancashire Parish Clerks had been updated. If you are interested in the records for Liverpool then take a look as quite few of the Liverpool Parish's have been updated. Hope these are the years that you have been waiting for. I have just been watching a program on the TV about Heir Hunters. In the Uk only one in three people leave a Will. If no Will is made then the deceased estate will go to the Treasury, if no beneficially can be found. The estate can only go to a blood relative. Usually the estate is passed from husband to wife or from wife to husband. Then if both parents are deceased the estate will go to the children of the marriage. If there are no children of the marriage alive then the estate will go to the nearest blood relative. If a heir can be found then they will become the beneficially of the estate. If no heir is found then the Treasury will claim the Estate. Making a Will should be given some consideration, especially if you would like your wishes to be carried out. Just came across this site today and i thought that it may be of interest to those who are researching their Ancestors from Australia and New Zealand. It is a free genealogy resource to share vital record information. Take some time to have a good look around the site as it should become quite useful. Yesterday i suggested that if you were up against a brick wall in your research you you should take a break and change direction. This is easier said then done as i have found out. I have been looking for a marriage record now for months,i thought that i had found it yesterday. On checking again today i made the decision that it was not the right record. How much time do you spend looking for the same records, trying to break down that brickwall? I am guilty of this , spending too much time looking for the same missing records. This year i am going to be more time efficient and move on to new research. I suggest that you do the same . These free research classes are provided by The Family History Library in Salt Lake City. They include England beginning Research, Germany, Ireland, Italy, Russia and USA. The rules are that i must write 7 things about myself and then put forward 7 Blogs . So here goes. 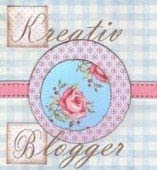 Now here are 7 Blogs that i put forward for the Kreativ Blogger Award. Your Ancestors Free.Com Turns One Year Old! On the 15th of Janurary this Blog turns One year old. Considering that most Blogs and Web sites do not make it to six months, i think it has done pretty well. Your Ancestors Free.Com started off as English Ancestors. It grew to include Ireland, Australia and New Zealand. My places of interest are County Down, Ireland and Lancashire so this Blog may reflex those areas. I know that there are many sites on the internet that require payment and many of you can not aford Membership. Hopefully you can find your Ancestors Free with the help that you find here. I enjoy reading your comments and i feel pleased when you have a success. So, here's to the new year and may you all enjoy your research and break down a few walls. 1.3 million Irish Records have just become available on this new site. The site is hosted by the Department of Arts,Sports and Tourism and is online as a guide to finding your Ancestors free. Not all of Ireland is covered at the moment but the records that they have online are completely free. So take a look.